More info:From £1249 excluding flights. Optional single supplement £385. Mimimum age 16. Enter a laid back rural world of vineyards, river banks and fairytale castles as you embark on a Canal du Midi cycling holiday in France that promises to be as naturally relaxing as it is quintessentially French. 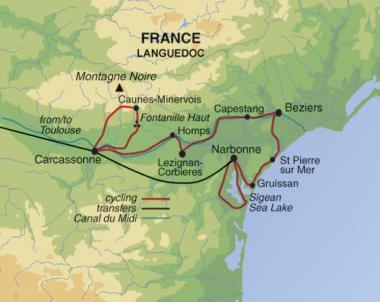 The route for this Canal du Midi cycling holiday in France features the classically charming villages of Laure-Minervois and Homps where soaking up the sunshine with a drop from the local Les Corbieres cellar leaves you embracing the moment as the sun soaks into the water. If you’ve never experienced the waterways of France before then a Canal du Midi cycling holiday is a splendid place to start with cycle rides on towpaths taking you between locks, bridges and riverside villages en-route to Narbonne and the sun-kissed shores of the Mediterranean. Accommodation & meals: The hotels used on this trip are all family-run and locally-owned. For lunch the groups will be taken to locally owned independent cafes and restaurants. Dinners will either be taken at the hotels or in local restaurants, both of which would benefit the local community. The accommodations we use on this trip are all close to towns enabling clients to go into town in the evenings and spend money with small businesses. Community: The trip takes the group through small villages and towns in the Languedoc region, with many small local businesses and artisans that are dependent on tourism for their livelihood; clients are encouraged to sample local wares when possible. The bikes used on the trip are hired from a locally-owned and run business in Carcassonne; for all our trips we use local operators over large retail chain stores for the rental of bikes. These small businesses have been founded by people with a love of cycling and who have cycled the very roads we will take on the trip. This ensures a more personalised service for both the operator and the end client, while benefitting the local economy. As this is a cycling trip, clients will interact with locals on scheduled stops, but also on the roads while cycling. Local drivers are generally very respectful and tolerant towards cyclists and it is pointed out to clients that this goes both ways – while clients are on holiday, it is important to respect the fact that local drivers may be working or just going about their everyday lives, and to impact this as little as possible: for example letting cars pass on the sometimes narrow roads, giving way to pedestrians and even, at times, livestock; rather than being simple observers and consumers, we are all responsible for promoting a climate of tolerance and mutual respect. Group size: This small group tour has a maximum of 16 participants, meaning that we have a low impact on the communities we visit and are able to ensure that we do not disrupt or lead to the displacement of local people. The small number also allows us to stay in unique, family-run hotels that cannot benefit from coach tours and other mass tourism due to its limited size. Activity: Few holidays have as little detrimental impact on the environment and local residents as a cycling trip. It is a quiet, low impact activity requiring comparatively little resources to support. This cycling tour actively encourages guests to chat with local people, visit local cafes and bars, purchase local produce, gifts and crafts and discover what life is really like along the Canal du Midi. UK office: It all starts at home so we have first worked at reducing our carbon footprint in our UK offices. Through energy conservation measures and recycling policies, we are proud to be actively reducing the waste produced and our impact on the environment. We support various projects all over the world to try and give something back to the places we visit.